One of the most anticipated match-ups in combat sports history officially has a home. GLORY, the world’s premier kickboxing league, today announced the location of its year-end show on Saturday, Dec. 10. 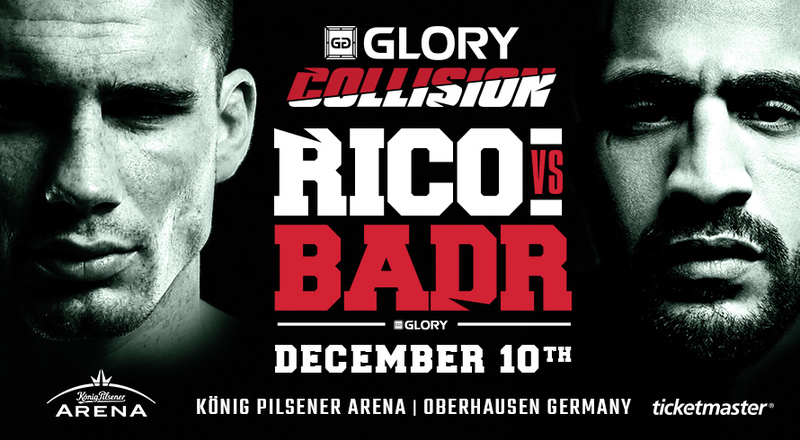 König Pilsener Arena in Oberhausen, Germany will serve as the site of GLORY: COLLISION, a special event headlined by the two biggest names in heavyweight kickboxing, as reigning GLORY World Champion Rico “The King of Kickboxing” Verhoeven (48-10, 12 KO) clashes with long-time divisional kingpin Badr “The Golden Boy” Hari (106-12, 93 KO) for a showdown years in the making. In just four years since joining the organization, 27-year-old Verhoeven has risen from promising contender to undisputed champion, including a 10-fight winning streak inside the GLORY ring and four title defenses. Hari, one of the most consistent fight-finishers of all time and kickboxing’s bad boy, is on a five-fight winning streak of his own (four by way of KO or TKO). GLORY: COLLISION is scheduled to be a stand-alone four-fight card, preceded by separate five-fight cards for both GLORY 36 and GLORY 36 SuperFight Series featuring world title bouts in multiple weight-classes and a one-night, four-man contender tournament. Tickets for GLORY: COLLISION (including entry to GLORY 36 and GLORY 36 SuperFight Series) go on sale Monday, Sept. 19 at 9 a.m. CET. Tickets will be available for purchase online at www.ticketmaster.nl and www.ticketmaster.de. Fans who sign-up for early notification (or have signed-up previously) at ticketmaster.nlor glorykickboxing.com will have an opportunity to purchase tickets for GLORY: COLLISION early, starting on Friday, Sept. 16 at 9 a.m. CET via www.ticketmaster.nl. Instructions for how to access the exclusive pre-sale will be sent via email in the coming days. Full broadcast details for GLORY: COLLISION, GLORY 36, and GLORY 36 SuperFight Series will be announced at a later date.